VCD Menu Lite is a free Video CD / DVD menu and title page generation program for Windows. Add this utility to your video toolkit and quickly produce simple but attractive menus as front-ends for your VCD / SVCD / DVD movie and slideshow presentations. Pick your colors, type in titles and menu captions, grab the frames from your movie clips, then export to a JPG image. 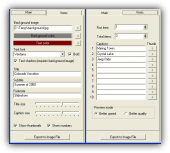 Use a VCD/DVD authoring program to convert your menu image into an MPEG still. Exe format (vmlite.exe, 869 KB). Download and run to start the installation. Frequently Asked Questions - A FAQ file for VCD Menu Lite is available here.